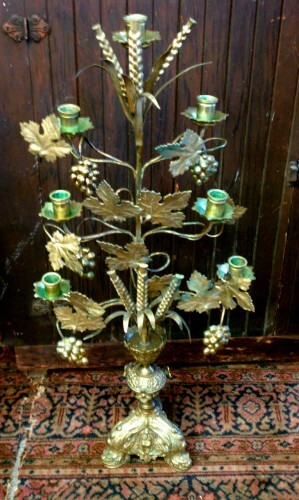 We just brought this Turn of The Century French gilt brass candelabra into Exit 55 Antiques on Sunday. (UPDATE: Now in our booth at F.A.R.M.) 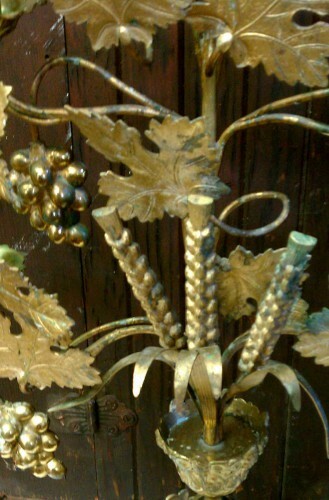 This ornate antique candelabra was made for a church altar; the sheaves of wheat & bunches of grapes are symbolic of the blessed bread & wine of the sacrament of the Eucharist. The depiction of Mother Mary on the base leads us to further believe this was made for and used in a Catholic church. There are signs of age and use, but it is a spectacular piece. We were so excited to bring it in & take photos, we forgot to measure it! It’s roughly 30 inches tall — but call the shop for more details: 701-356-9199 for more information, open 10 – 7 Monday thru Saturday, Noon to 6 on Sunday, Central Time. Or contact us directly. 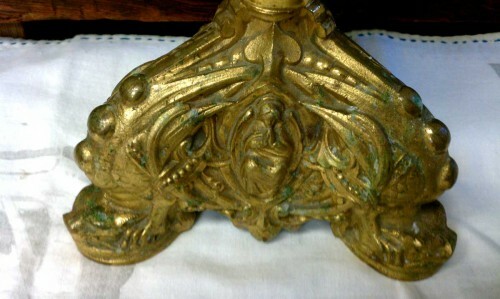 3 Responses to "Antique French Altar Candelabra"